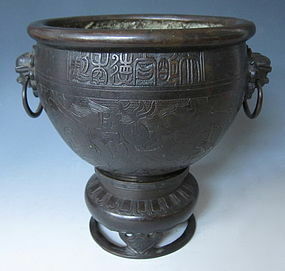 Antique Chinese bronze bowl with handles in the form of lion heads with rings in their mouths, incised with designs of dragons, horizontal relief characters just below the rim read Da Ming Xuande Nian zhi which translates as "made during the Xuande era of the Ming Dynasty". But most likely this bronze is 19th century. The bowl sits on a bronze stand with lotus petal motif. Total size: 6 1/2" high x 7" wide including handles (alone, the bowl is 4 1/4" high and the stand is 2 1/2" high). 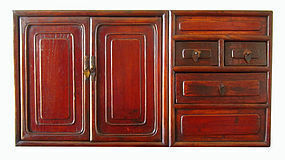 Chinese antique hardwood cabinet with interior shelving. 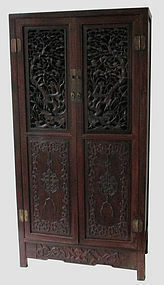 The cabinet doors are carved with pine trees and bamboo. The lower egister is carved with a rectilinear design. The bottom has a fan, a bat, and a lychee branch. It measures 70" tall 35" wide 16" deep. 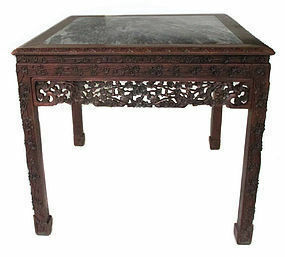 Antique Chinese hardwood table carved with incredible handcarved flowering plum blossoms details on branches that crawl up the table legs. The table top is inlaid with a piece of stunning white grey marble. Dimensions 38.5" wide by 38.5" deep 34.5" tall. 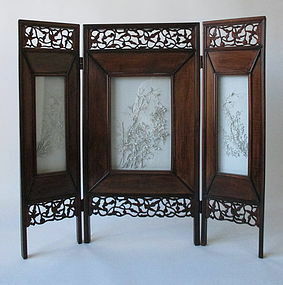 A marvelous three panel table screen done in a combination of Chinese hardwood and porcelain blanc de chine style panels. The central panel is an image of chrysanthemums in full bloom, the left panel is depicting bamboo and the right panel is a branch with dogwood-like flowers with a vine attached to its branches. Glass panels are used to protect the fine detailed work of the panels. 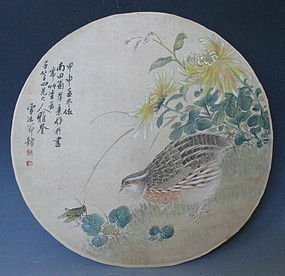 Age: 20th century Size: Length" 16.26" Width: 9.6" Height: 7.75"
A circular Chinese fan painting of a quail staring at a grasshopper set near a group of chrysanthemums. 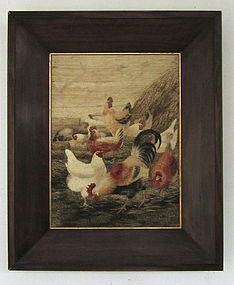 The work is inspired by the style of the artist, Nantian and was presented to an acquiantance named Zhisheng. The painting is signed with the name of Xueye. 19th- Early 20th century Size: Diameter: 11.5"
Chinese antique small storage chest, made of jumu (elm) wood with beautiful grain, original deep reddish brown translucent lacquer finish, small cabinet doors open to a compartment with a shelf on one side, the right side has three small drawers the larger of which has a hidden compartment underneath, a great table top chest, 19th century. Size: 13 1/4" high x 25 1/4" wide x 8 3/4" deep. 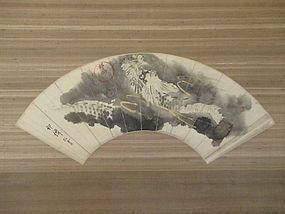 A rather unusual fan painting (senmen) portraying an image of a dragon rising above the clouds done using fingers. The tradition of finger painting is thought to have originated from China. Eccentric literati artists used their fingers instead of the brush to become one with the painting. Work contains a signature and seal by an artist named Sonsen. Additionally, the inscription on the fan reads: finger painted by Sonsen. 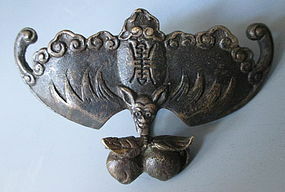 Age: Early 20th century Size: Height 55.5" Length 27.5"
A small Chinese brass lock done in the form of a bat with the character happiness on the back. The lock is done in a style where the peaches is a separate piece and when the lock is set, it appears as if the bat is carrying the peach. Age: 20th century. 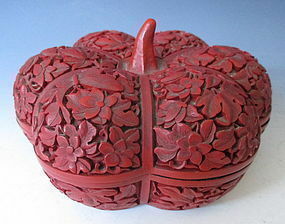 Size: length 2.25" width 3" height 1.5"
Chinese cinnabar lacquer box in the form of a lobed squash or fruit with stem for handle, deeply carved with intricate scenes of flowers and butterflies, interior is lacquered black.